The Oni School is organized and presented by the Tenkara Guides LLC, based in Salt Lake City, UT. The three guides, Erik Ostrander, John Vetterli and Rob Worthing, have been working together for 8 years now, and were the first tenkara guides outside Japan. They have been presenting the Oni School for four years, and have recently formed Team Oni USA LLC to be the US outlet for the Oni rods - Type I, Type II, Type III, and the newly introduced Itoshiro. (The Nissin Zerosum Oni Honryu rods are sold here on TenkaraBum.com.) Beyond selling rods, though, Team Oni USA’s mission is to introduce “Oni Tenkara” to US anglers. The Oni School 2018 is now over, and planning for next year’s school (the fifth anniversary) has already begun. This essay is a brief review of my impressions of this year’s school, and a superficial description of Oni Tenkara, which is what the Tenkara Guides call the style of tenkara that Masami Sakakibara (Tenkara no Oni, or just Oni) has developed over the the 40-odd years that he has been doing tenkara. 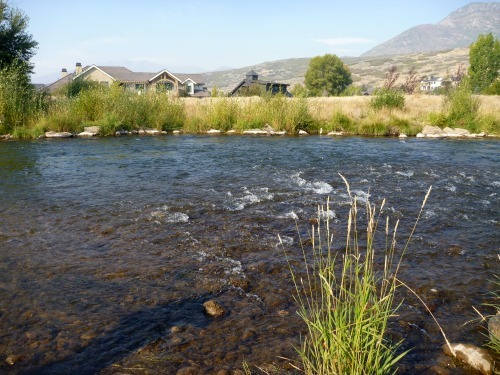 The Oni School is a three-day event, held this year on the Middle and Lower Provo River, just south and east of Salt Lake City. It started with an early morning meeting and brief orientation at the Sundance Resort, followed by a casting clinic, during which each student got one-on-one instruction from Oni. Erik, John and Rob also helped any student who had further questions (at the casting clinic and any time during the entire three day school). Following the casting clinic, Oni gave a demonstration of still water tenkara in a pond on the Sundance grounds. The demonstration showed casting, a simple pulsing manipulation, the sutebari technique (repeatedly casting to one spot and picking up for a new cast immediately after just the fly has touched the surface - which obviously did excite the stocked rainbows in the pond) and fish fighting technique. In prior Oni Schools, Oni fished the pond with a fly from which the hook had been cut at the bend, so fighting the fish lasted only the few seconds until the fish spit out the fly. This year, with regular hooks, Oni landed several fish. Although the fish were not large, his fish fighting style was consistent with how he fights a much larger fish. Following the demonstration at the pond, the class relocated to the section of the Provo that the Tenkara Guides had chosen specifically to illustrate how Oni approaches a section of any stream. How he does it is too complex to fully describe here, and I’m sure I don’t yet fully grasp the nuances, but the basis of his approach is to be able to fish all the likely spots, with both upstream and downstream presentations, without spooking any fish. 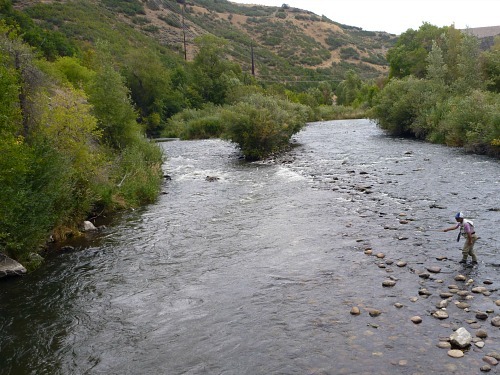 The photo above is from a prior year, but it illustrates Oni fishing the seam between the faster current and the slower water on the near side of the run. After he fished the near side of the entire run, he then came back down to the bottom of the run and fished the quiet water along the far bank. That allowed him to fish the entire run, bottom to top and side to side without spooking any fish by getting too close. This year he caught several fish during his presentation. I have written previously about my impressions of having fished with Tenkara no Oni, both in Japan and in the US. The first time, in Japan, and with no one there to interpret, the one thing I took away from that session was the importance of getting in the right position before making your first cast. In order to fish different spots, you almost had to be in different positions. Sounds obvious, but it most definitely was not wading upstream, casting upstream as you go. Sometimes he cast upstream, sometimes across and sometimes downstream from where he was standing. More than once, he stopped me from casting, got me to move to a different position, and then signaled I should make my cast. In at least one case, he stopped me from making an up and across presentation, moved me upstream, and had me fish that spot with a downstream presentation. That downstream presentation yielded a fish. I now believe that if he had thought my skill level had been up to it, he would have had me fish that spot with both upstream and downstream presentations. I have also written several times how I was surprised at the amount of time he spends fishing downstream from where he is standing. I had always believed that upstream presentations were superior (despite knowing that people do catch fish swinging wet flies, or doing a Leisenring Lift, both of which are downstream presentations). What didn’t really click until this Oni School (and this one was my third), was that the upstream and downstream presentations look different to the fish, and some fish that ignore an upstream presentation will hit a downstream presentation. With Rob Worthing’s descriptions of how Oni makes the upstream and downstream presentations, I proved that one to myself, fishing the same section of slow water along the riverbank four times, first with an upstream presentation near the surface, then an upstream presentation deeper in the water column, then after moving to stand in a different spot, with a downstream presentation near the surface, and finally a downstream presentation deeper in the water. I caught a fish on that last presentation. My fly had drifted past that fish three times already, but at different depths and speeds. A critical element in getting into the ideal position for each presentation, whether upstream or downstream, is not spooking the fish before you have a chance to make your first cast. To do that effectively, you have to plan out what lies you want to target, and where you will want to stand for each upstream and downstream presentation. To get into all the positions from where you will want to cast, and not spook fish to which you have not yet presented your fly (both upstream and downstream), you really do have to carefully plan it out in advance. You almost certainly will not hit all lies sequentially! If you just wade upstream, casting as you go, you are probably spooking most of the fish to which you have not yet made a downstream presentation. 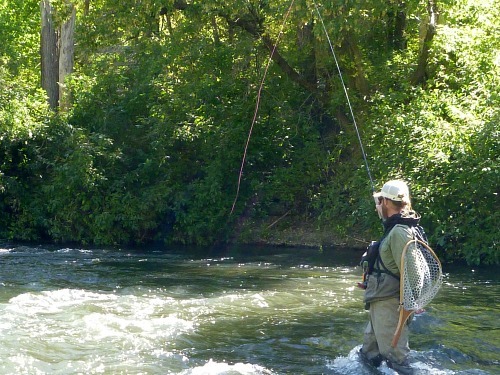 To be frank, if you are like most fly anglers, you wouldn’t have even thought of making downstream presentations. I know I wouldn’t have. Erik Ostrander demonstrating upstream shallow presentation. After Oni’s demonstrations on day 1, and for most of the day 2, we practiced what we had seen with respect to getting into the best positions for each presentation for each attractive lie. Doing drills making both upstream and downstream presentations. Day 2 was also wonderful practice in fishing on a windy day. I had gone to the Oni School with a serious misconception. I had thought that Oni only fished very light line - size 2.5 or even lighter. On day 2 he fished a size 4.5 line. With the strong wind, and the large fly he fished for at least part of the day, a heavy line was the best choice. Oni's trout by the bridge. There was a bridge near where we parked on the second day. We could see a couple nice fish from the bridge and Oni decided to fish for them. No matter how he presented his fly, they weren't interested. (We later learned that both had been caught by a couple anglers who by then were just downstream of us.) Oni then started casting across the river to a big eddy caused by the bridge abutment. Keeping his line entirely off the water, over the current, he held the fly in the eddy and pulsed it very gently. On his third or fourth cast, the nice fish shown above nailed his fly. Day three for me was a revelation. I have long known that quiet water just below a short shallow riffle almost always holds fish. I have always fished that feature from the side, which almost always involves trying to hold the line over the slower water on the side and fish the faster water just as it starts to slow following the riffle. Getting a good drift while minimizing drag is a constant battle. There was one truly excellent example of that riffle-pool feature where we started the second day. Oni stood well upstream of the pool and fished a straight downstream presentation, holding the fly stationary and making subtle pulses. He caught at least four fish and probably missed that many more. He never had to worry about current differentials or drag pulling his fly out of position. I never even would have thought of fishing straight downstream in that situation, keeping the fly on the surface when the rod tip was high, and under the surface when the rod tip was low. The pool below the riffle. It wasn't until his demonstration was over that I realized I had been watching so intently that I had forgotten to take a photo of his demonstration. The photo above is the riffle and pool. It was truly surprising that fish came up through pretty fast water to hit his flies as he pulsed them on the surface. Later in the day, I saw a similar feature and tried to mimic Oni’s technique. I got three hits although I managed to miss them all. Also on the third day, And with Erik’s instruction, I finally had success casting and controlling my line when fishing in a strong wind. I didn’t hook any fish, but just being able to cast where I wanted to and keep the line under control was a new experience. Size 4.5 line to cut the wind and a large bushy fly to anchor it helped tremendously. I had thought that wind was the kiss of death for tenkara fishing. I was wrong. The wind, like the current and the depth, is just one more variable affecting your line, fly and drift - which is what keeps tenkara complex rather than simple. The fishing in the wind and the success fishing a downstream presentation to a fish that had ignored an upstream presentation illustrates one of the tremendous benefits of the Oni School - and why it is actually more beneficial than flying to Japan - even for a guided trip by Oni himself. First, Oni’s English is limited, so if you are not fluent in Japanese your experience fishing with Oni in Japan will likely be similar to mine - you might come away with one major lesson, but little detail and no nuance. The Tenkara Guides have fished with Oni many times, both here and in Japan, and have been able to learn much more than anyone could possibly learn in just one session. 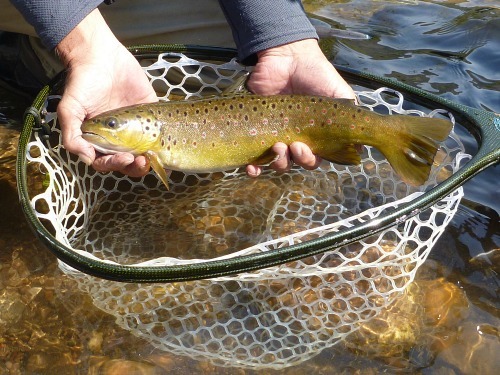 Also, they are extremely skilled tenkara anglers in their own right. Much of what I learned at the Oni School 2018 was from Rob or Erik explaining what Oni was doing, along with why and how he was doing it. And that is not to say that John is not their equal as a teacher and guide. When he and I get together, though, we mostly just hang out and fish - kind of like when the Guides first fished with Oni in Japan. They weren't looking for lessons - they just wanted to fish with him. Of course, just fishing with him - or with John, you will end the session knowing more than when you started.